I was so fortunate to get to chat with my friend Tammy Trayer as we recorded an episode for her latest radio broadcast on Mountain Woman Radio. It was like chatting with a friend over a cup of coffee (or in her case herbal coffee). Anyways, the discussion transitioned to an honest conversation about the struggles of learning to homestead. It’s not all rainbows and sunshine people! I hope I’ve been truly transparent about the struggles and discouragement I’ve had so far on my journey. One struggle that comes to mind is my difficulty learning to make bread. My family was losing faith in my ability to learn this skill, and honestly, I was losing faith as well. Finally I figured it out and it was an amazing feeling. That amazing feeling is what makes trying over and over again worth it. I think the key to being self-sufficient is not taking on too much. It’s all about taking baby steps. 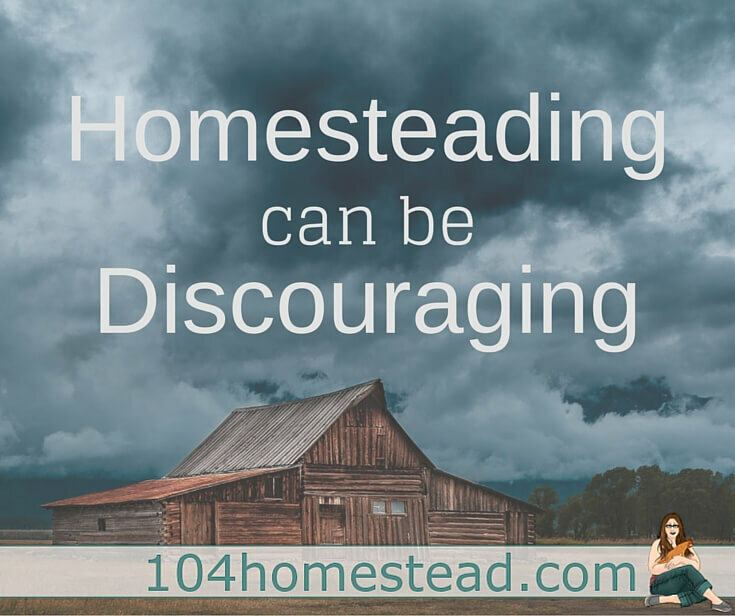 In case you’re wondering, this homesteading journey doesn’t have a final destination. Rushing the journey won’t help. By breaking down your big goals into smaller manageable goals, you increase your chances of success. Let’s look at this as an example: You want to learn to knit. Are you going to start with an intricate honeycomb patterned sweater or will you load up your kitchen with a bunch of dishcloths using various stitch patterns? If you start with a sweater, you’re progress will be slow. There might be holes in the armpits. The collar might be crooked. You are now discouraged and probably chucking those knitting needles into a tote, never to see the light of day again. If you chose to start with the dishcloths, you will get a feeling of satisfaction every time you wash down the counters. You appreciate how well the dishclothes you lovingly made out-perform those cloths you’ve been buying at Walmart for years. Start small and choose the dishcloths. Now you realize you can do more than you thought was possible. Maybe you want to tackle your own body care products. You start with deodorant because you heard that deodorant was one of the most toxic things we use on our bodies. After finding the perfect recipe online and spending the day concocting your masterpiece, you eagerly try it on. What’s with that burning sensation in your armpits? Eww, do you still stink? Yeah, much like finding the perfect shampoo for your hair, homemade deodorant can be a tough one with lots of trial and error. That’s okay. It’s part of the learning process. If you bought a store bought product that didn’t work for you, would you give up or would you try another brand? You’d keep trying brands until you found one that worked for you. Whether it’s your lifestyle or where you live, some things just aren’t meant to be. You’d be hard-pressed to grow papayas in Alaska, so why stress yourself out trying? Sometimes it’s not that extreme. In my case, I can’t grow carrots to save my life. It’s sad. I’ve tried year after year and the results are always dismal. Every year I say I’m done trying, yet every year I try again. One thing I’ve changed is how much space I am willing to give up for this endeavor. I won’t give up a lot of space in my garden for a crop that I can’t seem to grow. Failure doesn’t necessarily mean you have to give up, but it does mean you need to reassess your priorities. If it’s important to you, keep going for it, but don’t exhaust your resources. Your value as a homesteader is not based on the things you do. I hope you’ve seen through our Inspiring Homesteads that not everyone does everything. I certainly don’t do everything. I’m going to keep it real with you today. My daughter had a bunch of friends coming over for a birthday sleepover one weekend. Any of you that have a teenager know how much food a large group of teen girls can put away. I had priorities that particular weekend and cooking from scratch for the mob was not on the list. I went to the local grocers and picked up a couple frozen pizzas, some chips and salsa, and a couple bottles of soda. It was a special occasion after-all. While waiting in line to pay this woman approached me. Are you that homesteading lady from the internet? she asked me. (I love small towns lol). We got talking about how my chickens are doing and my plans for the permaculture gardens next spring. Halfway through our conversation about real food it occurred to me what was in my cart. I mentally willed this woman who was singing my praises not to look down. She did. I was embarrassed and felt like a hypocrite, but you know what? I do what I can do, and I know I can’t do it all. That’s okay. Don’t put unnecessary pressure on yourself. Do what you can and know that every little step makes a difference. Even one “real food” meal a week improves the health of your body. Each tomato you plant grows tomatoes that you didn’t have to buy. That one all-purpose cleaner you made is reducing the toxins in your home. Just keep learning and growing. Celebrate the success and don’t be discouraged by the failures. It happens. That’s homesteading. I can really relate to this too. One area I find particularly and routinely discouraging is when animals die (that weren’t intended to). Most non-homesteaders might be accustomed to the occasional loss of a pet, but losing animals that you treat like pets that also provide you with food can be uniquely discouraging because a lot of time and resources may have gone into them PLUS, you enjoy them! Gardens can be similar. When your food is tied to your failures, your failures feel much deeper than most. Homesteading definitely requires optimism. Friends who can encourage are a big help, and for many of us, a luxury. Your poor little carrot! For some reason I cannot grow oregano, go figure. All other herbs are fine but I’m (secretly) blaming it on the seeds. 🙂 I believe the same, do what you can and be willing to accept what you can’t and move on. Sometimes it’s hard though. We want to be able to do everything! Thanks. Great post. And I needed the “baby steps” reminder? Thanks, Jessica. This came to me today when I most needed to see it! I’m so sorry if you are currently dealing with disappointment,but I’m glad you found this post when you needed it. Such an inspiring post, Jessica! Thank you! We’re in the city, with a tiny, shaded backyard. We’ve tried three years of veggie gardening: “moveable sled” gardening, bucket gardening, and finally raised-bed square foot gardening. The first two years were pretty much complete failures. Last year was better by a sliver, but still a pitiful amount. This coming year, we might take over the neighbor’s backyard: she has way more sun and less trees/roots. I am a firm believer that optimism pays off. Good luck! I can totally relate!! I have been dwelling on the things I want to do as a homesteader and not enough on what I am doing. This post was both insightful and inspiring.